I don’t know why, but the current and planned deployment of Russian, American, British, Israeli and Iranian warships in the region’s waters reminds me of a Haka dance – this time preceding a “friendly” water polo match. I think the “finals” are still a long way off. Two Russian warships – the antisubmarine destroyer Admiral Chabanenko and the missile-firing Yaroslav Mudry arrived yesterday at the Russian Navy’s maintenance and supply base in Tartus, Syria. The port call, which will last a few days, is viewed as a soft deterrent. But a Russian Navy spokesman says the visit has nothing to do with the Syrian crisis. Russian vessels rarely use the Tartus base, a strategic asset for Moscow dating back to Soviet times, but civilian and military personnel are stationed there permanently. Iran’s Rear Admiral Ali Fadavi says his IRGC (Islamic Revolution Guards Corps) forces will next month hold new naval exercises focusing on the Strait of Hormuz, sea route to some 16 million barrels of crude daily. The Iranian armed forces’ Navy ended its own 10-day drill in the strait and Sea of Oman in early January with a threat to block passage through the strategic waterway if the West pressed ahead with new sanctions against its oil exports. The United States, which vows to keep the international waters of the strait open, is gearing up for a major missile defense “exercise” and “deployment” with Israel this spring. The drill, code-named “Austere Challenge 12,” is designed to test weaponry and tactics as well as multiple Israeli and U.S. air defense systems against incoming missiles and rockets. 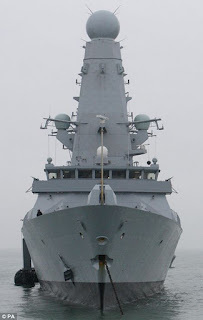 The United Kingdom’s Royal Navy is sending to the Gulf its most advanced warship, the HMS Daring. The Type 45 destroyer, reportedly equipped with stealth technology and the world's most sophisticated naval radar, departs Portsmouth January 11.